Add all the ingredients in a bowl and mix well. Transfer to a serving dish, cover with plastic and refrigerate until ready to serve. You can prepare this sauce several hours in advance and store in the refrigerator until ready. If you can’t find serrano peppers, you can substitute in fresh jalapeños. This sauce is also the base for preparing guacamole; just add a mashed avocado and you’ll have an exquisite dip. 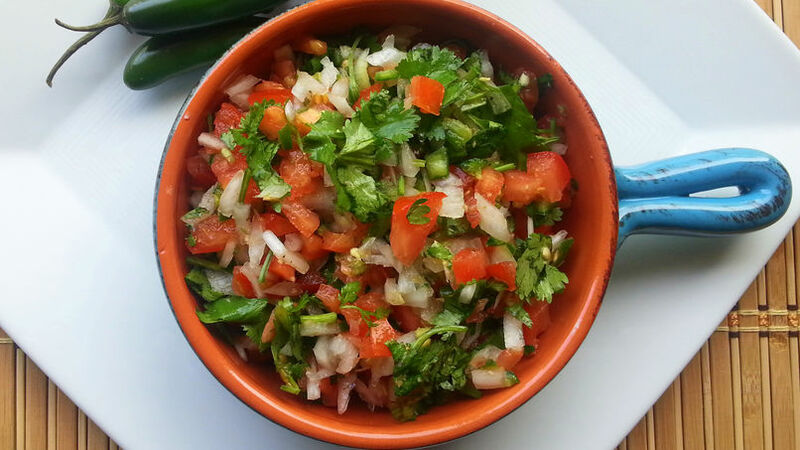 The sauce known as pico de gallo or salsa mexicana is an excellent condiment for adding to meals or just for dipping using totopos (tortilla chips) for a quick snack before dinner. When creating a special appetizer you have to consider several elements: the flavor, combination of ingredients and textures. Sauces help put just the right toquecito in your dishes; so I invite you to take this tip and try it out on your next meal. Let’s get cooking!